After a long week of work and a plan to go hiking or camping on the weekend, it’s tempting to just to throw together some items and get away to the outdoors as quickly as possible. As much as we want to just get outside and hike or bike with our kids, we also have to teach them how to safely be outdoors. It’s a good idea to get your kids thinking about carrying some sort of gear to keep them prepared. It only takes one time of not being prepared to understand the importance of this. Here are three tips to help teach your kids to be prepared when outdoors and why it really matters. From the earliest ages, kids are watching us and learning, even though it doesn’t seem like it. They will remember that one time you didn’t fasten your seat belt or you said something you shouldn’t have, and then they will use their uncanny ability to bring it up at the worst possible time for you. Oh yeah, anyone with kids has been there. When packing your gear for trips, be sure to always pack the sunscreen, extra water, extra clothing, and first aid gear each and every time. Talk with your kids about why you are carrying the “extra” items to explain why they might seem like extra, but that they are important to having a safe and fun outdoor trip. With my kids, I have to tell them something about 739 times before it sinks in. 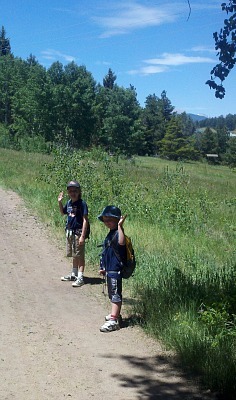 If I have to lead by example and take them on 739 hikes or bike rides before being prepared sinks in, I’m ok with that. As part of the learning process for kids, let them also take part in being prepared. Have your kids be in charge of gathering all of the preparedness items for an outing, and let them carry some of the items too. Of course, double check those against you own checklist to make sure you don’t forget anything. This may be frustrating at times and take a lot longer to pack, but kids respond much better when they are contributing to the process. 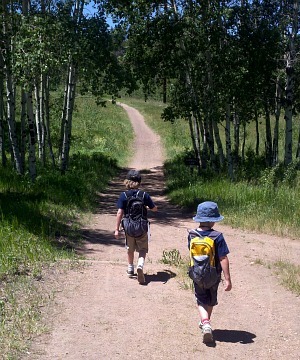 My kids (ages 5 and 7) are in charge of their clothing, sunscreen, extra snacks, and their Kid’s Safety Kits. The kit functions as a safety kit for our hikes, but it also serves as a reminder to my kids to be prepared. My wife came up with the idea for these kits after seeing the adult OutThere kits. The kid’s kit contains three essential safety items – small LED light, whistle for signaling, and waterproof ID card on a breakaway lanyard. Or even make up a kit of your own. If you child is into drawing and carries a backpack with them everywhere, make sure they have items in the pack to keep them prepared. This is probably the hardest one of the three. Let’s face it, safety and preparedness is not the most exciting topic in the world. Rope or paracord could be added to help them practice knots while in camp. 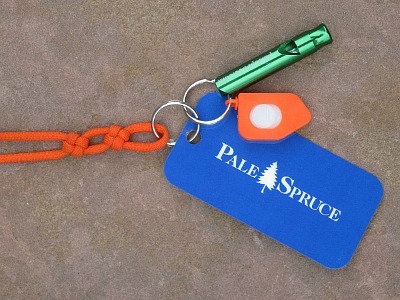 A small waterproof canister/pill fob like the one on this lanyard to give kids a small “secret place” to store little items they pick up a long the way and want to carry home. It’s amazing how creative kids can get when they know they have their own place to put their secret finds. If your child is carrying items in their backpack, they could include any of the above items, but also a small roll of duct tape. Who can’t have fun with a little duct tape? And, if something needs fixing, they can lend a helping hand. It’s never too early to teach your kids the importance of being safe and being prepared. Hopefully these 3 tips will help you out and give you some ideas to use with your own kids. The key is being consistent about teaching them and also trying techniques to make it fun and interesting for them.